LOVE, NOT TIME, IS WHAT MATTERS! I write while on break together with my siblings (or what remains of us after both parents and others have all passed on) – a much awaited and, I should say, much deserved trip to Europe. We do this actually in honor and homage of both our parents whose hard work and vision made it possible for all six of us surviving siblings to actually spend this much on a European trip, given the dour economic conditions now all over the world. We are spending money both of our parents worked so hard and saved up for in their lifetime. They deprived themselves, and worked themselves raw, so that we may be able to get the best opportunities they themselves did not have, or did not get. They both had a different vision of time than most young people nowadays, perhaps including us, now have. Their vision of time is one that transcended the here and the now, and covered the hereafter, the future, not the immediate future, but the future that includes God and His plan for humanity and the world. They sought the Lord, even more than they sought after riches and material goods. They sought after our future, even before they looked after their own comfort and well-being. Not engaged in filling themselves up, they lived full lives, despite the absence of what we might now call material comfort and legitimate pleasure. With feet firmly planted on the ground, they had their sights focused up above, on Christ for whom they lived, and for whom they died, so to speak, in their own little ways. They did not follow the bandwagon of those who worked and readily spent all the fruits of their work on personal comfort and pleasure. They lived to the full, while loving truly and fully with the total gift of themselves, and the gift of their work to us whom they loved fully till the end. Such was their story made of, and this is the story of most of the people I grew up knowing and admiring in my very little then sleepy town (read: modest and poor) of Mendez, Cavite. My parents’ story is just about the same story of everyone I knew while growing up in my hometown. Such is the picture of generosity, the same generosity that today's gospel passage would have us reflect on. That generosity of God is the kind that does not put a premium on time and the length of service, but on the intensity with which whatever is done, is done. Such generosity is not the kind that counts minutes and hours, but counts the depths of one's love, the intensity of one's desire to be of service, to offer oneself to the Lord, who is, in the end, the only valid reason for whatever it is one likes to do. But God does not put a premium on the amount of time we put into anything. He counts on the most important thing with which we do what we are supposed to do – love and the intense desire behind what we do. My parents represented perhaps a generation of people who espoused a different work ethic. They did not count hours. They worked while there was the possibility to work. They did all they could for us their children, filled with the intense desire to give us the best they could, from early morning to late at night. I would like to think that the workers in the vineyard all had that intense desire to work for the vineyard. They were people who wanted sincerely to do something for the vineyard, and were willing to be hired at whatever time, for whatever need. It was not their fault to be seen jobless late in the day and hired later during the waning hours of the workday. Man's thoughts and indeed not like God's thoughts. 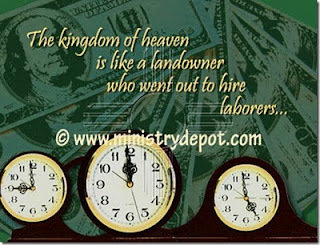 God hired even those who could only work part of the day, through no fault of their own. They could not find work, but they had a deep longing to work, and that was enough for a generous God, whose thoughts are definitely not like ours. God's vision of time, is not like ours, too. He did not count the minutes, the hours, the days, and the weeks, but He counted on the intense desire and love that workers were willing to put into the job. A little like my parents who did not count the hours they worked so hard for us, so that one day, we could enjoy what we surviving siblings could do in these days, God looks at the heart, and sees the deep longing the jobless workers had, even in late afternoon. The vineyard owner hired them, and gave them what was due to every worker, at whatever point in time they started working. And in the end, it is not a question to minutes, hours, days, and weeks … It is all matter, not so much of material physical time, as a question of one's intense longing and love with which one does what one is called to do, early in the day, at midday, or late in the day.